Not so long ago I mused about how governments can lie with statistics, focusing on incredible claims of 12% annual GDP growth in Myanmar. I find transparently lying with statistics to be a puzzling thing for governments to do, because the most egregious cases are obvious to everyone, and why bother fabricating data that everyone knows is fabricated? That question aside, some governments clearly do put effort into lying with statistics. And it’s hard to quantify how much they are lying. One very cool recent study by Jeremy Wallace looks at GDP figures and electricity consumption rates in China to show that provincial GDP figures seem to go up more during politically sensitive times. Still, sometimes a picture is worth 10,000 words. And today, via the Supply Side Liberal, I come across this incredible figure by Ezequiel Tortorelli. This has to be in the top 10 best political economy graphs of all time. 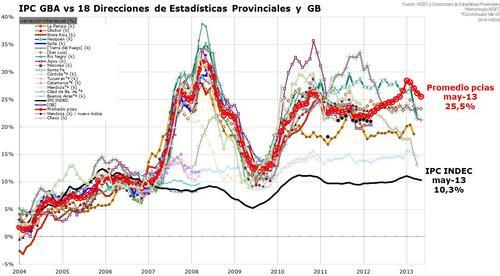 It shows the difference between national inflation figures as released by Argentina’s federal government (the black line) and the inflation figures released by Argentina’s provincial governments (the other lines). The divergence in 2007 corresponds to a widely acknowledged move by the government of Cristina Fernández de Kirchner to start intervening in federal statistics. Lying with inflation statistics, illustrated. Yet still I wonder—given that everyone, even me, already knew that the Kirchner government’s statistics were fishy, why do this? Doesn’t Andrew Little have a Russia paper, about voter fraud, that might supply the mechanism? Everyone knows you are going to cheat. But showing that you can really, really inflate the numbers signals power. Or something like that. That’s right! And here’s the (excellent) paper: http://www.andrewtlittle.com/papers/little_fmne_web.pdf. But there is a small issue the extent of monitoring: “if monitoring is extremely strong, as with the ballot counting in Singapore, the amount of fraud will become arbitrarily small.” In that model, it must be the case that monitoring is imperfect. I’m not sure how to reconcile that with the observation that we know with certainty that the Kirchner government is cooking the books. Thanks both! Tom is right that according to the logic of the model you would always want to make the statistical agency as independent as possible to remove the possibility of (inefficient) distortion of the numbers. Without the data to back me up (anyone? ), I think most countries *do* try to keep those producing the stats generally insulated from political pressure, potentially for this reason, so the question is why Argentina is such an outlier. That’s more a question for the Argentina experts, but perhaps politicizing one agency is a way to signal to others that they could be next if they don’t do what the regime wants? Could also be a path dependency argument where once people lose faith in the stats it is hard to lower expectations of how much they are distorted (i.e., they wouldn’t trust the “monitors”) so the government needs to keep cheating to match expectations.